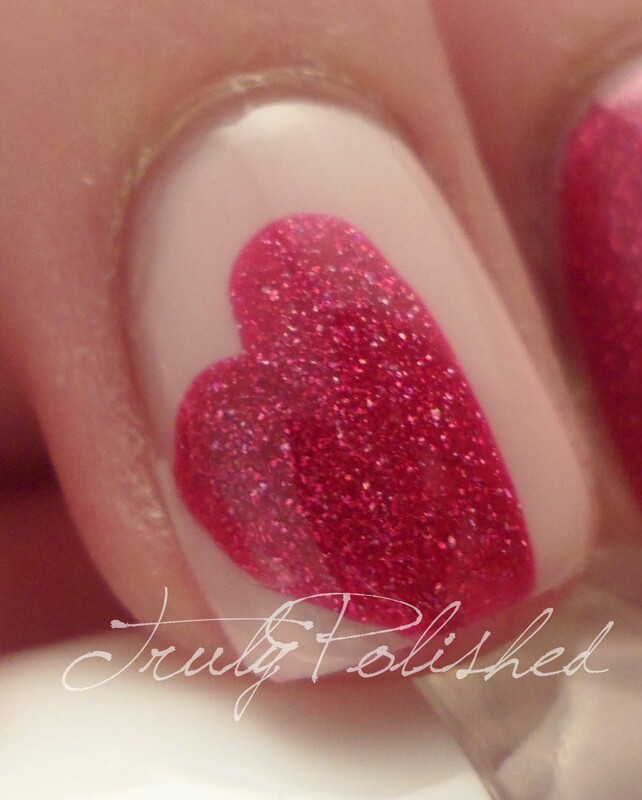 Truly Polished: Happy Valentine's Day! Anyway, today is Valentine's Day, not that you would know it in my house! Let's just say we aren't all pink hearts and love songs here! Nevertheless, this is Valentine's Day and I wanted to mark it with a pretty pink manicure. This is the first manicure that I have photographed in my new lightbox. I got it on Monday, and while I was playing with it I knocked over one of the lamps and the bulbs went. So I bought new bulbs and replaced both, so I hope you like the new photos! Let me just say, it felt really good to do a little bit of nail art, even if it was just a little bit! I freehanded the heart as best as I could with the brush from the bottle, and then at the left hand side I used my opposite thumb nail to create the line. Then I filled the gap with Simply Pink with a striping brush. I love how this looks, it's the first thing like this I've done in absolutely ages! What do you think of the lightbox photos? I'm really happy with them, the bulbs give off the perfect level of light. The only thing I must say is that I didn't use a matte top coat. This was glossy (I used the Models Own topcoat) but the diffused light takes the glossiness away. I don't mind how it looks, but it's worth a mention! If you want to know more about my lightbox and lamps, then check back next week because I'll hopefully have a post up about it! Happy Valentine's Day. Whether you're single, in a relationship, or "it's complicated" I hope you're having a great day!